A P-51 Army fighter plane exploded in mid-air and crashed on the farm of Joe Phillips about 5 miles south of Franklin yesterday (i.e. January 7, 1948--J.T.) afternoon about 3:30 p.m., killing the pilot wearing identification tag of Thomas F. Mantell (Jr.), 3533 River Park Drive, Louisville. 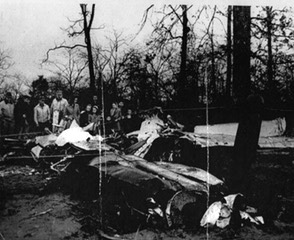 The wrecked plane bore the (tail) No. Ky. NG 869. Mrs. Joe Phillips said she was sitting by her fire when she heard the plane, with the engine apparently in trouble, flying near her house. Almost immediately there was a large explosion. Startled, she glanced out the window and saw the disintegrating plane hit the ground in a woodslot about 200 yards away from the house. Pieces of wreckage were seen a quarter of a mile from the point of the crash. Several people in Franklin reported they heard the explosion. DAYTON, Ohio - The only airman who ever got near a flying saucer crashed and died before he could describe it, the Dayton Journal-Herald said today. The newspaper printed a lengthy dispatch on the mysterious flying discs, based it said, on hitherto unpublished reports assembled at the Wright-Patterson Air Force base. The Air Force investigation has proved that the flying saucers "are not a joke." Neither are they a cause for alarm to the population" the newspaper said. The closest any airman to the mystery discs was on Jan. 7th, 1948, when one was sighted over Fort Knox, Kentucky the dispatch said. Four fighterplanes were sent aloft to intercept it, but only Capt. Thomas F. Mantell was able to get close. "I'm closing in to take a good look," the newspaper quoted him as reporting by radio. "It looks metallic and of tremendous size. It's going up now as fast as I am. That's 350 miles an hour. I'm going up after it. At 20,000 ft., if I'm no closer I'll abandon chase." 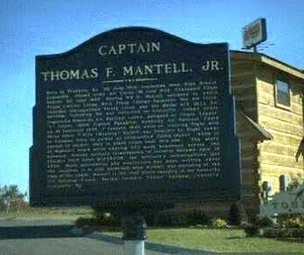 Mantell's plane crashed a few minutes later and he was killed. The paper said a report on now file at Wright-Patterson Airforce Base lists 240 domestic and 30 foreign accounts of flying discs as having been investigated. Of these 30 per cent seem to have been weather balloons and the like and 30 per cent more are perhaps explainable conventionally-leaving 40 per cent unexplained. The Air Force recently said there was no evidence that the discs were guided missiles fired from some other country, but that on the other hand it was not impossible that they were. Later the Air Force announced it was not making any further comments on the discs. At 0020, twenty minutes after midnight, an airman, watching one of the outpost's radarscopes saw a target appear. It looked like an airplane because it showed up as a bright, distinct spot. But it was unusual because it was northeast of the radar site, and very few airplanes ever flew over this area. Off to the northeast of the station there was nothing but ice, snow, and maybe a few Eskimos until you got to Russia. Occasionally a B-5O weather reconnaissance plane ventured into the area, but a quick check of the records showed that none was there on this night. By the time the radar crew had gotten three good plots of the target, they all knew that it was something unusual - it was at 23,000 feet and traveling 1,500 miles an hour. The duty controller, an Air Force captain, was quickly called; he made a fast check of the targets that had now been put on the plotting board and called to a jet fighter-interceptor base for a scramble. While the radar operator was trying to pick up the target again, the F-94 arrived in the area. The ground controller told the pilot that they had lost the target and asked him to cruise around the area to see if he and his radar operator could pick up anything on the F-94's radar. The pilot said he would but that he was having a littie difficulty, was low on fuel, and would have to get back to his base soon. The ground controller acknowledged the pilot's message, and called back to the air base telling them to scramble a second F-94. The pilot continued on toward where the unidentified target should have been. Suddenly the F-94 radar operator reported a weak target off to the right at 28,000 feet They climbed into it but it faded before they could make contact. A third F-94 had been scrambled, and in the meantirne its crew took over the search. They flew around for about ten minutes without detecting any targets on their radar. They were making one last pass almost directly over the radar station when the radar operator in the back seat of the F-94 yelled over the interphone that he had a target on his scope. The pilot called ground radar, but by this time both the F-94 and the unidentified target were again too close to the radar station and they couldn't be picked up. The F-94 closed in until it was within 200 yards of the target; then the pilot pulled up, afraid he might collide with whatever was out in the night sky ahead of him. He made another pass, and another, but each time the bright spot on the radar operator's scope just stayed in one spot as if something were defianfly sitting out in front of the F-94 daring the pilot to close in. The pilot didn't take the dare. On each pass he broke off at 200 yards. As usual, the first thing I did when I read this report was to check the weather. But there was no weather report for this area that was detailed enough to tell whether a weather inversion could have caused the radar target. Then he went on to back up his argument by pointing out that when the ground radar was switched to short range both the F-94 and the unknown target disappeared. If just the unknown target had disappeared, then it could have been weather. But since both disappeared, very probably the radar set wasn't working on short ranges for some reason. Next he pointed out that if there was a temperature invenion, which is highly unlikely in northern Alaska, the same inversion that would affect the ground radar wouldn't be present at 25,000 feet or above. UFO In Flight - Best Evidence Ever? Trindade Island is located at 20° 30' S. and 29° 20' W. in the Atlantic Ocean, about 1200 Km. off the coast of Brazil, the country to which it belongs. It is a small, rocky place, used during World War II as an antisubmarine base by the United States, but largely abandoned since. In October, 1958, during the International Geophysical Year, the Brazilian Navy established a meteorological and oceanographic station there. During January, 1958, the sailing vessel Almirante Saldanha of the Hydrographic and Navigation Division of the Brazilian Navy had anchored there, and on the morning of Jan. 16 was making ready to return to Rio. Besides the normal crew of the Almirante Saldanha, under the command of Jose Saldanha da Gama, there were on board submarine divers to take underwater photographs around the island. This civilian group was headed by Amilcar Vieira Filho, a lawyer and bank executive, and, among others, included a retired captain of the Brazilian Air Force, Jose Teobaldo Viegas, as well as Almiro Barauna, a professional photographer. All in all, 48 ocular witnesses were on deck during the incident. Also on board, but not on deck, was Captain Carlos Alberto Bacellar, who had been responsible for the revamping of the installations on the island and was commander of the oceanographic station. A few words concerning Barauna are mandatory, as the circumstances made him the leading character of the play. At the time, Barauna was 42 years old and had had a previous involvement with the subject of UFOs. It was he, in 1953, who had refuted the authenticity of the photographs taken by Ed Keffel at a place known as Barra da Tijuca(1). In so doing he had prepared photographs which demonstrated how such hoaxes could be perpetrated. It is unfortunate that the late Dr. Menzel, a somewhat unsuccessful debunker, as well as others(2), used Barauna's article to cast dispersions on Barauna, presenting him as a professional hoaxer. On Jan. 6, 1958, amid preparations to cast anchor, Barauna was on deck with his f/2.8 lens Rolleiflex Model E camera. As he was prepared to take photos of the final trip of the small boat used between ship and shore, he had set the camera at f/8 and 1/125 second. The sea was not calm, and this had upset Barauna who had forgotten to take his seasickness pills. 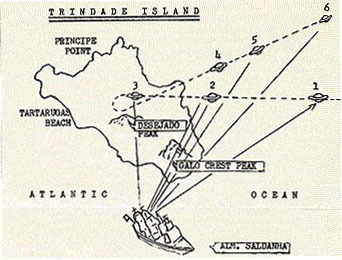 At 12:20 p.m. excitement broke out on deck at the fast approach of a bright object moving toward the island. Filho, Viegas and Lt. Ribeiro shouted to Barauna, gesticulating and pointing to the object in the overcast sky. It took Barauna about 30 seconds to get going; he then proceeded to take six photographs (at intervals of 14 seconds, as determined by later tests). 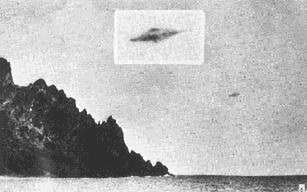 The first two photographs were taken as the object approached the island. It then disappeared behind the central mountain (Desejado Peak) for a few seconds; as it reappeared a few seconds later, now moving in the opposite direction, it appeared closer and bigger. It then moved at high speed toward the sea, but Barauna missed the object in his next two frames, owing to the speed of the object and the confusion prevailing on deck at the time. He did obtain a final photo when the object was already far out to sea and when it, apparently, had stopped momentarily in mid-air. After about ten seconds it moved away and disappeared in the distance. The photos were taken on a bright, overcast day, and the settings on the camera led to slightly overexposed negatives. It was, however, a wise decision of Barauna's not to attempt to modify the settings; if he had done so he might have lost his opportunity. According to Capt. Viegas, the object was like a flattened sphere encircled at the equator by a large ring or platform. In Barauna's words, "..it made no noise, although with the shouting of the people on the deck and the noise of the sea, I cannot be certain. It had a metallic look, of an ash color, and has like a condensation of a green vapor around the perimeter, particularly in the advancing edge. Its motion was undulating, like the flight of a bat." As determined by the photographs, the object was tilted slightly, the upper part directed toward the motion. It appears quite sharp in photos 2 and 3, corresponding to the closest approach and minimum speed, while the contours appear slightly blurred in photos 1 and 4, corresponding to the maximum distance. In view of the distance from camera to object, a shutter speed of 1/125 second is sufficient to freeze an object moving at speeds of several hundred miles per hour. (The Brazilian Navy estimated the speed of the object to be 600 to 700 mph.) The object shown in the four photos resembles the planet Saturn, and it is not luminous. The photos were proclaimed authentic by John T. Hopf, APRO photographic analyst, as well as by the Cruzeiro do Sul Aerophotogrammetric Service, to which they were referred by the Brazilian navy. A dome-shaped UFO with portholes was seen in broad daylight by veteran pilot Floyd P. Hallstrom of Oxnard, California. Hallstrom had been flying for 37 years, 1712 as a Navy combat air crewman and personal crew chief to admirals, including the Commander-in-Chief of the Atlantic Fleet. 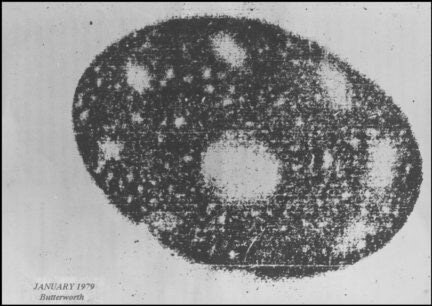 "All of a sudden I was able to make out the complete form of a saucer shape or round object...I could see the dome, also very vividly clear, including all the windows.... [I] observed it to be of a very bright metal...it was more of a nickel or highly polished chrome or stainless steel type of metal than aluminum because it had more of a mellow glow than [if] it was of the type finish on a high finish aluminum." Photograph taken by an RAAF Serviceman on 2nd January at 6.15pm at Butterworth/Penang, Malaysia. The object was described as glowing in bright orange colour and had several portholes lining the edge. There [the witness] discovers a sort of ovoid vehicle, with the general shape of two half spheres of unequal volume, clearly separated by a flat ledge, extending at least 15 cm and forming a ring around the metallic mass which has a... height of between 2 and 2.5 m/... The machine lifts off, making a slight amount of dust and with a soft whistling. Then itseems to tilt, exposing its underside, and it takes off at lightning speed, passing exactly between the two tall trees, at the exact spot from which it had seemed to fall. Last night, an Australian family reported that their moving automobile was lifted from a road by a brightly glowing egg-shaped UFO. They said that the craft shook their vehicle violently and put it back on the road. Investigating authorities said the damaged vehicle was found to be covered by a gray ash-like substance which is being analyzed. Occupants of other vehicles in the area and a fishing boat crew also reported the UFO, and the authorities were said to be taking the reports seriously since there were so many witnesses. Mrs Knowles and her there sons were driving form Perth to wards Mundrabilla when they saw lights ahead of them on the road. As they approached they realized that they were hovering above the ground just off the main road and indeed hovering over another vehicle. They turned of the main road and chased back towards where the sighting had occurred; unfortunately, the light changed its course and came back to meet them. They met when something making an audible noise landed on the roof of their car. The car was apparently dragged upwards and there was some consternation and agitation amongst the witness. Suddenly the vehicle was dropped back to the ground where it burst one of its tyres; where the object had been attached there was damage on the roof. Once the car was back on the ground their family leapt out and hid in the bushes until the UFO had gone. From their observation they described the object as a white light about the size as their car, making a sound like electrical humming. Thoughout the incident the radio of the car had been malfunctioning though subsequent investigations by Paul Norman of VUFORS indicated that it was undamaged. Examination of the tyre indicated that it was ripped in the most extraordinary way all around its edge. Subsequent investigations revealed a great many more UFO reports on the Nallarbour Plain on that night. After these events, a bump (strangely, a dent) remained behind on the roof of the car and analysis of the dust found there showed the presence of oxygen, carbon, calcium, silicon, potassium, and perhaps also of astate, a radioactive element of synthetic origin. The witnesses, who did not maintain their anonymity, were broadly ridiculed by the Australian media. A huge, dark, disc-shaped object, reddish-brown in color, vanished suddenly in the skies over Coulommiers, France at 1:14 p.m. European time. The UFO was sighted by the crew of an Air France A320 airliner, and reported to air traffic control. Ground military radar tracked the UFO for 50 seconds at a speed of 100 knots. About one hour later, at 8:20 a.m. local time in Lancaster, New Hampshire, a diamond-shaped UFO with blunt points paused in the sky, then vanished. 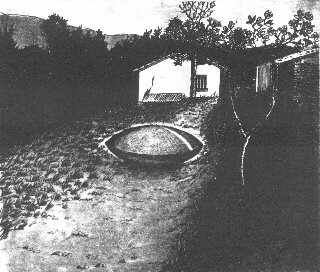 (Source: Paul Ferrughelli, Computer Catalogue of UFO Reports, 1988-1994). Gov't Coverup, Dozens of Witnesses. 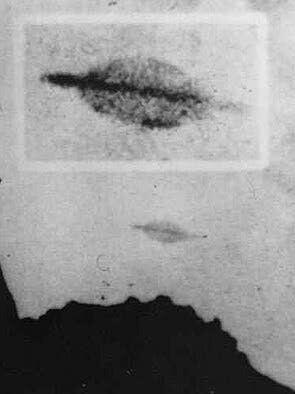 Hoax or Brazilian Roswell? An unidentified flying object was picked up on US radar over Brazil (there were no Brazilian satellites), contact was however made with the Brazilians and the information was relayed. The Brazilian Air Force was scrambled while many people on the ground saw a cigar shaped craft expelling large amounts of smoke heading for the ground. In other parts of the town there were many anomalous lights reported. The Brazilian Army and the local fire service went to the crash site in a coordinated joint operation. They go to the crash site as indicated by local eyewitness reports. On searching the area, a craft was not located, however an EBE was. It was wrapped in a camouflage net then put into a 1meter (3ft) square box before being loaded into a Brazilian Army Truck by soldiers. On the same day, three girls (Liliane Fatima Silva, her sister Valquiria and Katia Andrade Xavier) saw a creature of the following description: Brown, soft skin ('like a heart'), large, red, bulging eyes and visible veins. They ran home and told their mom, who, being more bothered about something scaring her girls than being shot with an extraterrestrial AK-47 went after the creature. All she found was a footprint with a round palm and two long straight, forward facing toes. Meanwhile, the Brazilian Army move the creature to the local hospital. It was a hot day and there were numerous townsfolk out on the streets who witnessed the military operation. By now, the press was on the trail, they were however, refused any coverage by the army, the reporters who failed to comply were scared off by soldiers. There was no identification of the creature from the hospital or the military. Some members of the Brazilian army who actually held the creature after packing it into the net gave their report on the event to UFO researchers despite being told not to talk, at risk of losing their jobs. All reports however were in agreement as far as who was involved, the equipment used, etc. 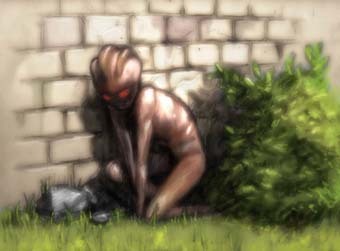 The creature seen by the girls was not wearing any clothes and did not seem intelligent; maybe it was an extraterrestrial animal. After the event, a woman attending a party at a local soon saw an identical creature as the girls had seen. Dr. Leila Cabral, a member of the zoo staff report anomalous problems and five unexpected deaths of animals with inconclusive port mortems. This photo appeared in a recent issue of UFOCUS, but it was not in color. It was taken in Denver, Colorado, January 1996 by Joe Clower, who was photographing some workmen painting the gold balls on a city monument. He was waiting for the workmen to get ready for the photograph when he saw this strange bell-shaped flying object in the sky. 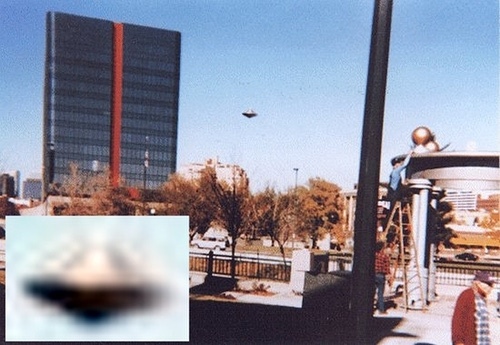 Since the camera was already in hand, he took one picture while the object was at the left of the tall building. Then the object went behind the building and came out on the right side, and Joe took this second picture of it. There are three people in the photo, one on the ladder, one at the bottom of the ladder, and one man walking past. None of them seem to be aware of the UFO. might've been a big room in there." On the night of Jan. 4, 2000, and early the morning of the 5th, in several townships outlying Chicago, Illinois, an enormous Black Triangle craft with intense lights and operating entirely outside the parameters of known aerial technology was witnessed by police officers as well as citizens from several different cities and districts along a path of more than a hundred miles. The collective descriptions of the craft conform to complete one of the most controversial and perhaps substantial and empirical cases of UFO phenomenon in history. The WREX Channel 13 Television in Rockford, USA, and other news media reported that they had received some 600 reports of UFOs over this city in Northern Illinois around 9:00 PM on January 11, 2001. As many as twelve lights or UFOs were reported conducting maneuvers over the city. Some reports of computer and electrical shutdowns coincided with the reports. Later that night on all three of the news stations in Rockford reported the sightings. 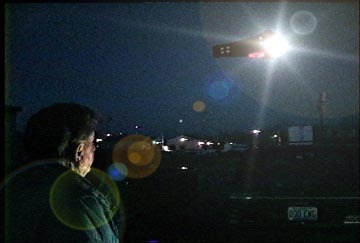 Some people reported seeing six lights while others reported seeing a dozen yellow orange lights hovering in the sky. The light sightings were made from 8:50 to 9:00 PM. Sightings have been fairly regular in recent months over the city. January 26, 2003 - UFOs Captured By SOHO? This picture was taken in space by the Solar and Heliospheric Observatory (SOHO), a spacecraft, about a million miles from earth. Mike Murray, one of the founders of EUROSETI, said: "Some of the pictures are real crackers. They are the archetypal flying saucers - disc shaped objects with some kind of glow around them. Many have a pulsing light and leave a trail behind them. They come from all angles and directions." According to Murray, the craft were said to be moving in a way that suggested intelligent control. "There's one especially which is really fabulous. 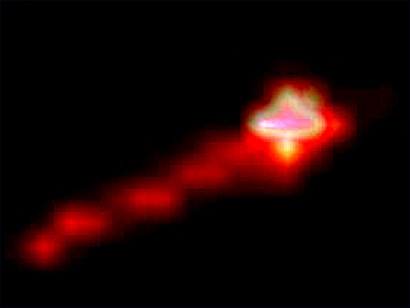 It is a glowing disk with a pink disc-shaped object within the glow, and a turret on the top, Murray told BBC. "The first thing we did when we got the images was to speak to NASA, who said it was a camera fault. But by enhancing the images we proved this wasn't the case." He said NASA then suggested the objects could be asteroids or comets - but this did not explain the way they appeared to move independently and make turns.